Celebrating the life of Benjamin M. Keller "Ben"
Obituary for Benjamin M. Keller "Ben"
Benjamin M. Keller “Ben” age 83 of Lincoln, passed away peacefully at Journey House on April 1, 2019. Born August 2,1935 to Edward & Olga Keller. Ben always looked forward to Czech Days in Wilber, NE never missing a year. 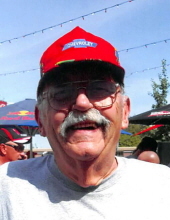 He was an avid Husker Football fan, being a season ticket holder since 1959. He always looked forward to volunteering at the local VA Hospital. Ben is survived by his sons, Mark Keller and his significant other, Suzi of Fort Collins, CO and Adam (Heidi) Keller of Salem, OR; Daughter, Noelle Keller of Lincoln, NE; Grandchildren, Anna & Matthew Keller whom he was very proud of; Dog, Ellie. He is preceded in death by the love of his life, Marge; Daughter-in-law Lindy Keller; His beloved cats, Wan, Beglee, Sami, and the tolerated, Simba. To send flowers or a remembrance gift to the family of Benjamin M. Keller "Ben", please visit our Tribute Store. "Email Address" would like to share the life celebration of Benjamin M. Keller "Ben". Click on the "link" to go to share a favorite memory or leave a condolence message for the family.